ALL OF OUR PRODUCTS ARE MADE FROM SOLID WOOD. 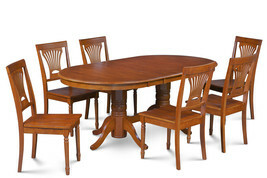 NO MDF, VENEER OR PRESSURED WOOD USED INCLUDES This oval-shaped dining set includes one dining table with your choice of 5 Piece, 7 Piece, or 9 Piece set with wooden seats finished in Saddle Brown. WE NEED YOUR PHONE NUMBER FOR DELIVERY APPOINTMENT, PLEASE PROVIDE WHEN CHECKOUT. MEASUREMENTS Table: Width 42" x Length 60" - extended to 78" with 18" butterfly leaf x Height 30". Chairs: Width 18", Depth 18", Back Height: 38". 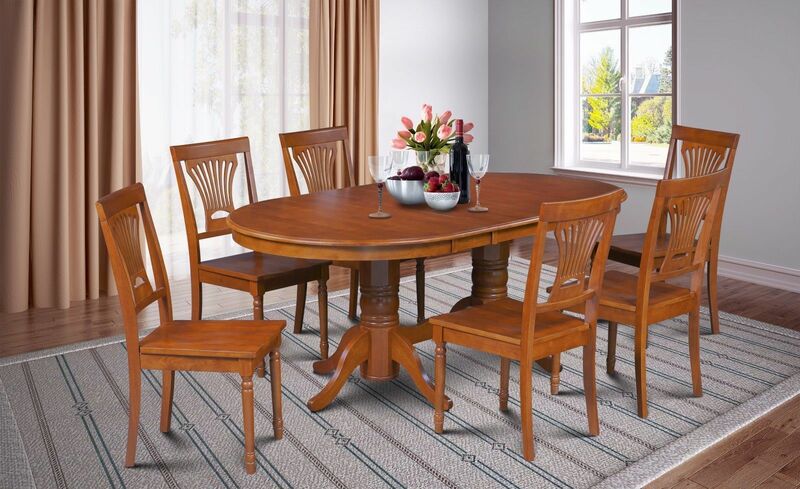 Seat Height 18" FEATURES This Somerville dining set creates a comfy and cozy contemporary dining room or family room when you have guests coming over. Its gorgeous solid Asian rubber wood is enhanced by Saddle Brown finish, while attractive and sturdy a double-pedestal table base add charm. 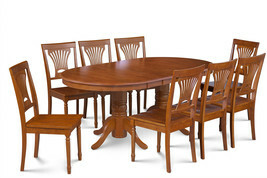 Dining set is carefully crafted of solid Asian rubber wood for extra strength, durability and gorgeous saddle brown finish. This vintage-styled legs table can be comfortably seated up to 8 people. Not only you'll love to entertain with this dining set, but also you'll be thankful for the table's an 18-inch, self-storing leaf that allows you to extend the tabletop when you have guests. Convenient adjustable levelers make the dining table more stable on uneven floor surfaces. The kitchen chairs carry beautiful carved legs that offer one of a kind look. Napoleon-style chair back starts your day with easy resting in comfortable chairs with wooden seats for easy clean up after spills. Customers' simple assembly required. Two chairs are packed per carton. Customer’s simple assembly required. Chairs are packed two per carton. TERMS of SALE and FEEDBACK: Feedback is extremely important to and to family as we build our business. If you are happy/satisfied with your transaction, please take a moment to leave Positive Feedback. Communication is KEY! If there are any issues, PLEASE contact us BEFORE leaving a neutral or negative rating. Many issues are easily resolved by contacting the seller before contacting. Customer Satisfaction is our TOP priority! We promise we can make you happy if you give us a fair chance. Payment is expected within 3 days of your purchase. 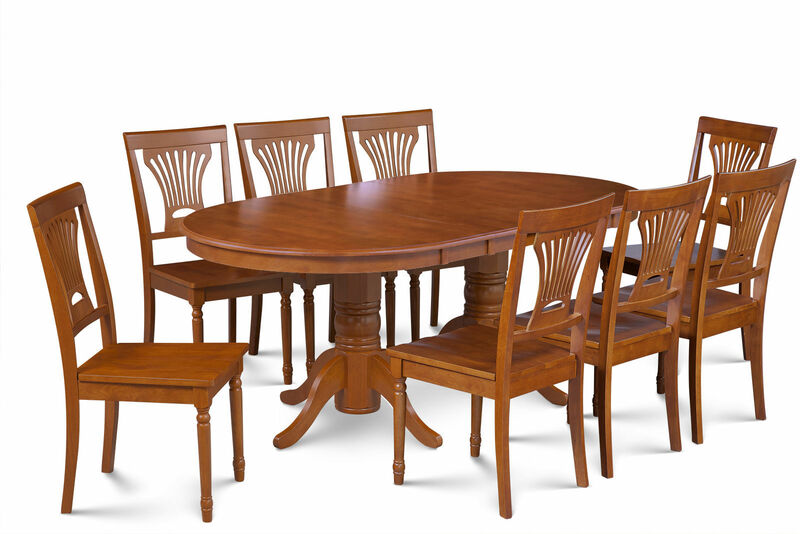 PRODUCTS: Our beautifully-designed dining room furniture products includes Dining room sets, Counter Height Pub set, Dinette Kitchen table sets are made out of 100% rubber solid wood widely called Asian hard wood, by outstanding workmanship for both durable and long-lasting. 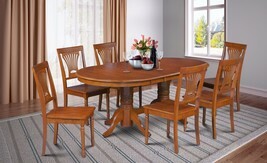 This exquisite product line includes distinctive wooden counter height dining sets and bar stools. The designs of our dining room furniture products are sleek and modern but retain a timeless elegance, blending the best of old and new. Gorgeous upholstery, rich wood stains and flowing, graceful lines combine to make these furnishings both impeccable and refined. 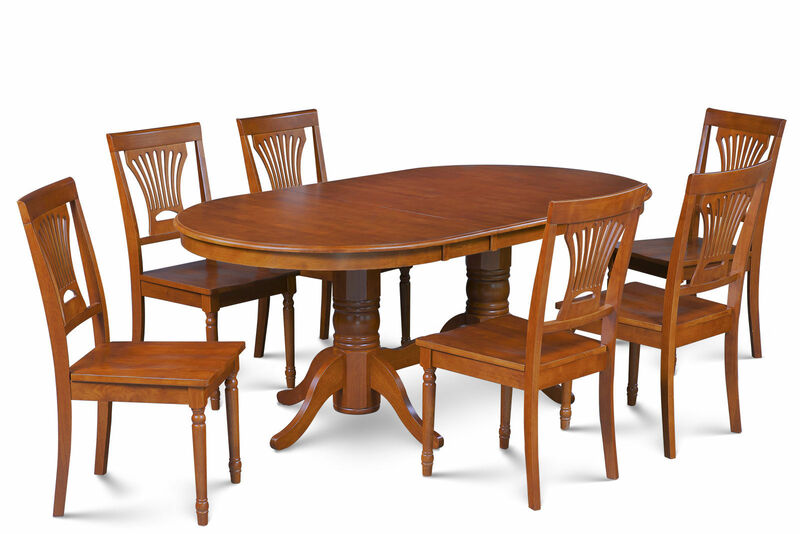 We import all our Dining Room Table Sets and Counter Pub Height Products directly from family-owned furniture manufacturers, so we're able to ensure the highest standard of quality and provide our customers with stunning designs that aren't available anywhere else. SHIPPING POLICY: We ship dining room furniture to any destination in the contiguous 48 states only. Please leave your phone number when check out, so trucking company will call for delivery schedule. When your order is shipped, we will notify you via email. Included in your email will be a tracking number for your shipment. You should track your package online or on the phone with the carrier. Most companies can provide an estimated delivery date. Be sure to contact us if anything seems unusual with the progress of the shipment. We have two methods of shipment available: Small Parcel, Truck Freight . SMALL PARCEL: We will ship chairs or stools via small parcel UPS, FEDEX Ground. These chairs and bar stools are packed 2 in each box. These companies provide the fastest and most reliable method of shipping. It’ll take between 2 and 10 business days after it leaves the warehouse to your door. We do not require signature for deliveries, but please note that the delivery man may leave your package at your door without signature on his own discretion. If you want an item left at your doorstep, the best thing to do is leave a note on your door asking the driver to leave your package with "No Signature Required." Be sure to include your name and tracking number on the note. TRUCK FREIGHT: For shipping of whole dining table set which is too large and heavy, we will use LTL trucking company. Truck Freight Shipping is different from standard UPS, FedEx: Once your merchandise arrives at the delivery terminal, delivery agent will call you to set up a delivery appointment. Most truck delivery companies offer appointment time frame (usually 2-4 hours) between 8:00am and 5:00pm EST, Monday through Friday. - The products will be delivered to the driveway or curb outside of the delivery address provided upon purchase. It is the customer’s responsibility to transport the product(s) inside. However, several truck freight companies offer additional services to help move dining table set from the truck into your home or office. When your merchandise leaves the warehouse, we will email you the tracking information and you can contact the shipper directly to inquire about additional shipping services. In this event, it is your responsibility to directly pay the truck delivery carrier for any additional services. Please inspect the package(s) at the time of delivery. If the box has any damage, or if there is any reason you are concerned with its packaging or delivery, please write, “Product Damaged” clearly on the sheet the delivery agent asks you to sign. This simply insures that if there is any damage, it will be easy to take care of the problem. 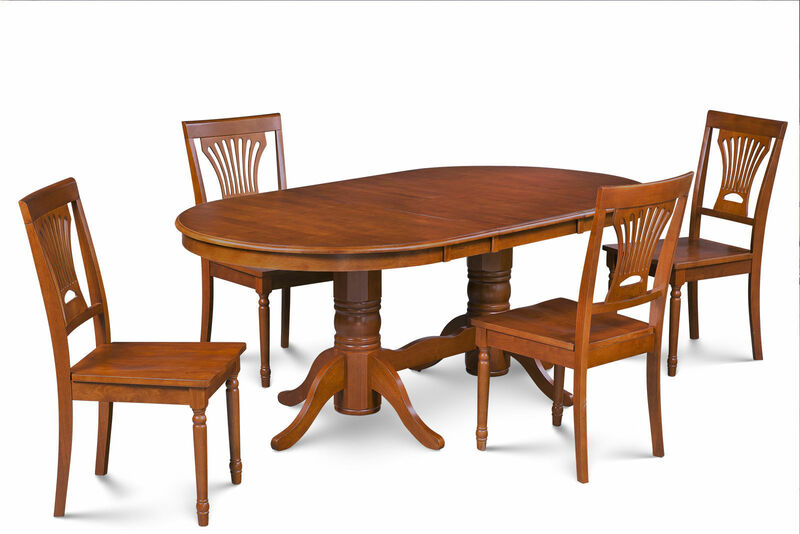 ESTIMATED TRANSIT TIME: Because all of dining room table and chair products are stocked our warehouse, we normally ship out your order within the next day. If you wish to pick up your order, it’s available any time, please call ahead before heading to our warehouse. Estimated transit time is the time when your order will be picked up from our warehouse to you destination: Standard Ground: 2-10 Business Days. Truck Freight: 2-10 Business Days. DAMAGE RETURN POLICY: Our intention is to ensure your item arrives in perfect condition. In very rare case that your order arrives damaged, we will make every effort to help you obtain the necessary replacements as quickly as possible at no extra cost to you. We will replace whichever parts are needed to give you a complete undamaged unit. This is often quicker than replacing a whole unit. If there are too many damaged parts, a new unit may be sent to you at our discretion. In most cases, you are required to provide photos in order to fulfill your replacement requests. Photos are generally requested to confirm the extent of damages for us to determine if replacement parts or a full unit replacement is required. We encourage our customers to accept their order despite the condition at delivery. This is because a refusal of a damaged shipment can increase the time it takes to process replacements. Please write a note on delivery documents when notice abnormal damages or tear so we will have evidence to claim with insurance and to expedite replacement items. If for any reason, you are not satisfied with your purchase, we will gladly accept your return on within 14 days of you receiving your item(s) we don’t accept return assembled items. Unopened box items will be accepted with original outbound shipping cost deducted from your refund. Opened box items also accepted with 20% restocking fee and original shipping cost deducted. The return shipping will be the responsibility of the customer.